CANoe.CANopen enables efficient planning, management, simulation, test and startup of CANopen networks. 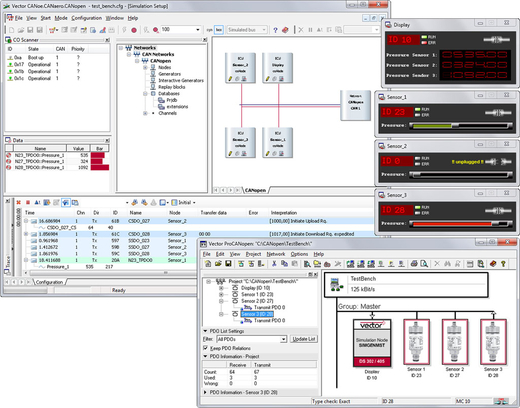 During the system design phase the user has the opportunity to simulate the later behavior of a system, estimate the bus load, and draw conclusions, like the necessary hardware performance, supported with extensive, CANopen-specific functions. CANoe.CANopen includes the configuration tool ProCANopen and the EDS editor CANeds. A significant aspect of CANoe.CANopen is the automatic generation of simulation models. The application oriented C-based language, CAPL (communication access programming language) from Vector is used as the programming language for this purpose. All information necessary for the generation exist in the device descriptions that are set up using ProCANopen. The entire CANopen-specific functionality of an ECU is simulated by a nodelayer-DLL. The user can utilize the functionality of this DLL by means of function calls from a generated CAPL program. This makes it very easy to initiate a SDO access to another device in the network from the CAPL program. Full coverage of the CiA310 test specification, which forms the basis of the CiA Conformance Test, is thus ensured. A test environment for a CANopen network can be generated at the press of a button. In turn, this makes it easy to create application tests. 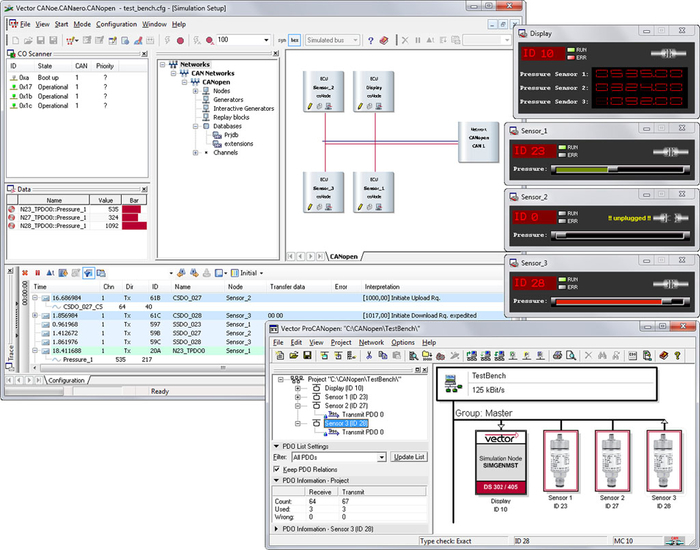 Simulated network nodes can be "remote controlled" by a user created test sequence. The user triggers a PDO transfer from the simulated node to the DUT (device under test) by a simple function call. Another function call by SDO reads the output value from the DUT and compares it to the target value. In a trace window the CAN message traffic is displayed while simultaneously interpreting the protocol information it contains. The user not only sees the service that is currently being executed, but can also see all relevant service parameters at a glance. This information is displayed in clear text and gives the user a quick overview of the chronological order of individual protocol sequences for the observed CANopen services thereby making it significantly easier to localize errors in a real system. If there are any signal definitions (objects segments which can be defined within the new XML standard) made within the EDS file, those signals are displayed in the trace window automatically. CANoe.CANopen uses the standardized file formats EDS and DCF to store data. Also the new XML format (XDD and XDC) regarding CiA 311 is supported by the CANoe.CANopen. Simple data exchange with any other CANopen tool such as CANalyzer.CANopen is guaranteed.